iOS may pack a decent amount of emoticons by default, but online, you might have caught wind of the latest craze in self-expression – unicode faces. Using all manner of strange characters, people have been coming up with some pretty humorous faces, and if this kind of thing floats your boat, then the fact that you can add them to your iOS keyboard (provided that you’re jailbroken) should put a smile, or rather, a (◕ ◡ ◕) on your face. 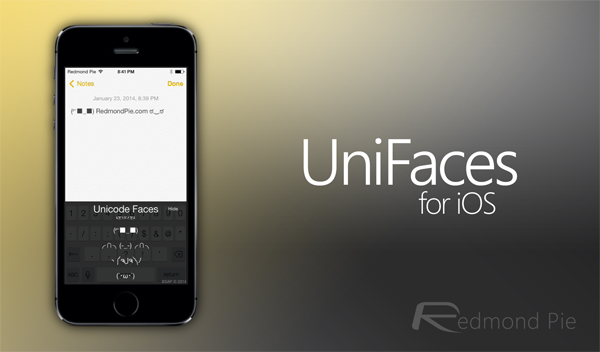 Check out the new UniFaces jailbreak tweak, which lets you do exactly this, after the leap! Thanks to the Evasi0n7 jailbreak, the wonderful world of Cydia can once again be explored by inquisitive iPhone, iPad and iPod touch users far and wide. This time around, it seems as though the folks behind the tweaks have been taking full advantage of the universal untether, working extra hard to deliver on both quality and quantity. This is never a bad thing, particularly since a jailbreak is never guaranteed, and in the past few weeks alone, we’ve seen many old tweaks enhanced and improved, along with some fascinating new entries to the fold. Tweaking or modding the iOS keyboard is close to impossible without the wonders of a jailbreak, but once you have done it, you can begin to enjoy the sort of flexibility that only Android users really get to experience. The UniFaces tweak might not offer more fluidity when typing, and it certainly won’t prevent AutoCorrect from working its, erm, magic, but if you happen to have grown partial to those cute / annoying faces, then this tweak will allow you to integrate them into your keyboard. All you need to do, once you’ve installed UniFaces, is hold down the space bar, and you’re good to go. It’s worth pointing out, though, that this is a beta release, so expect performance to be a little rough around the edges at times. You will need to add the following repo under Sources in Cydia: http://cydia.myrepospace.com/seatanners/ after which you will be able to search for and download the UniFaces tweak. It’s free of charge, so download it, give it a whirl, and be sure to leave your thoughts in the comments!